Gregoryology is pleased to announce that we have successfully converted to The Next Generation of Genealogy SitebuildingÂ© Version 6. 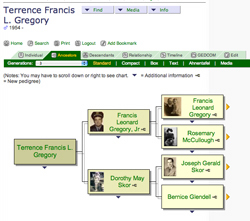 Descendancy Chart: Now see an individual’s descendants in graphical “box” style, with photos (where they exist). Pedigree Chart: Move smoothly back and forth among your ancestors without refreshing the page, using AJAX technology. Media: All around more flexible. Plus, now link media directly to events and places. Videos and sound recordings are supported now also. Albums: Assemble any number of photos, histories, or other media into an “album” to create experiences around specific individuals, families or other topics. Timelines: See lifetime events for each person on your timeline chart, plus add events for any date in history. Bookmarks: Users can save pages within Gregoryology that they’d like to visit again. Latitude & Longitude: Add coordinates to media & places, possibly for use with Google Maps and other programs. New Menus: It’s easier to get around your site, and the options are more readable too. Security: Passwords are now encrypted with MD5, making them impossible to decipher. Search: You’ll find more search options, with faster results. Gregoryology is dedicated in providing the most up to date information using the most technologically advanced software and hardware.